Many homeowners want to cozy up around a fireplace when temperatures drop—but no one misses hauling wood and cleaning out the chimney. This season, try a hassle-free alternative: a DIY (and flameless!) campfire. Camping season is nearly over, but the cozy season is only just beginning. Along with the urge to stockpile blankets and keep the oven filled with pumpkin pie, you’re probably ready to curl up by a fire. But not everyone has a hearth at home—and even if you are so lucky, you probably know how its expenses (fuel, chimney cleanings, and so on) make it a bit of a mixed blessing anyway. 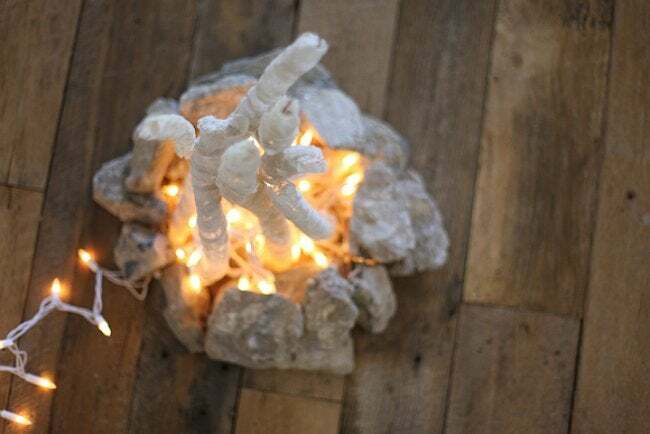 If you want the glow of burning embers in your living room without installing an entire fireplace, consider this craftier alternative from BLDG 25 that gets its luminescence from a set of string lights. Obviously, a fire pit that bridges the gap between authentic and appropriate for the indoors starts with a handful of supplies from outside, so the design team at Free People first collected a number of small branches and rocks. But each piece of wood—then wrapped in foil, Elmer’s glue, and overlapping strips of white lace—serves only a temporary cast in this project. 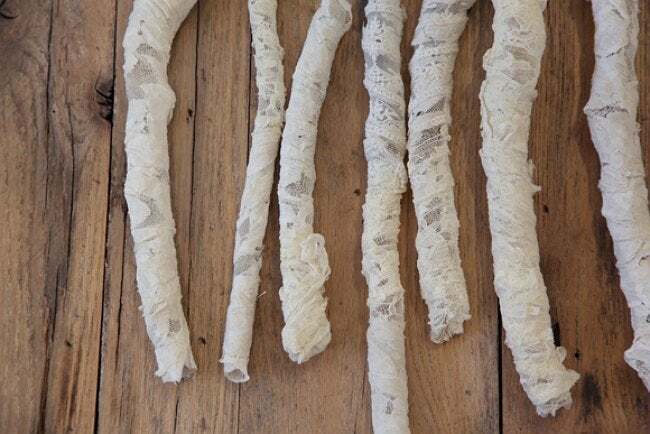 After the glue dried completely overnight, the sticks were cut out with a sharp utility knife. Once you peel away the foil, all that’s left is a set of ghostly birch-like branches. The rest of the DIY lighting project was as picnic in comparison: They grouped the large rocks in a circle, bundled string lights inside, and arranged the faux branches like real firewood in a cone-like structure. As the temperatures dip and rainy fall weather ensues, this creative reuse of twinkling Christmas lights has us scoping out the best outlet near which to situate a fake fire pit (not to mention pondering whether it’s too soon to pull out the holiday decorations). Sure, you’ll have to make the s’mores over the stove, but you’ll also have access to electricity and Netflix. So invite a few friends over, and gather ’round the glow!